The desire to prevent something that has happened already is central to American culture, requiring moral urgency to identify and correct its cause while excusing the parade of violations that occur on the way to the target. Violence produces in its victims and witnesses an obsession with reverse-engineering, a need to relive the event again and again, each time drawing a clearer picture of how things happened, which we always trust will lead us to an understanding of why. Though not exclusively, these impulses tend to always lead politicians to art, where the connection between ‘how’ and ‘why’ is most tenuous. In the weeks following the murders in Newtown, violent videogames were listed as a major and controllable factor in Adam Lanza’s killing of 20 elementary school students and 6 adults. 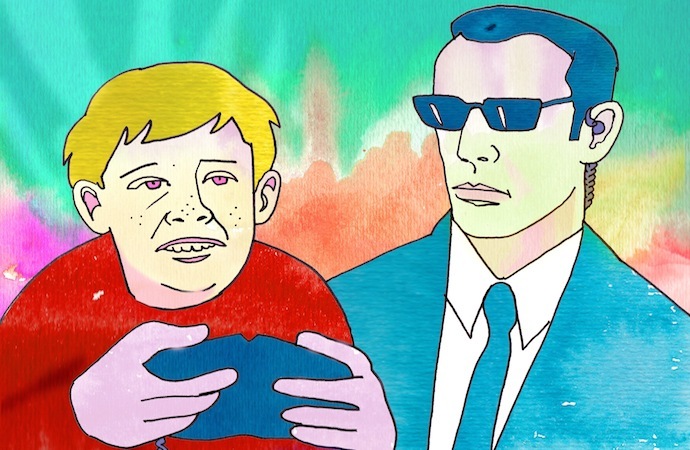 “The violence in entertainment culture––particularly, with the extraordinary realism to videogames, movies now, et cetera––does cause vulnerable young men to be more violent,” long-time game antagonist Joe Lieberman said. Joe Biden called a summit of videogame executives, developers, and researchers to meet in Washington D.C. to determine whether these accusations had merit and, paradoxically, what the games industry could do to limit such accusations in the future. President Obama followed up the meeting with a call for $10 million in new funds to research the effects of videogame violence. And this week CBS reported sources close to the case said Lanza was “likely acting out the fantasies of a videogame.” It was also suggested Lanza had wanted to emulate Anders Brevik, the Norwegian school killer who was widely said to have been influenced by violent videogames, in spite of his direct testimony to the contrary. No amount of explaining can dispel the suspicion that games act on us, performing some neuronal witchcraft that weaponizes our subconsciouses. Because the accusation is a superstition it is imperishable, just as no amount of knowledge and experience can convince someone alone in a darkened bedroom that there might not be something astir under the bed. There is always something in the shadows, and our logic is as good as justifying our superstitions as it is seeking truth. There has been a significant amount of research into the effects of art on violent behavior throughout the years, and in the last 20 years much of that research has been directed at videogames. Many tests use the basic structure of splitting players into two groups, one that plays a violent game and one that plays a non-violent game. After a play session both groups are interviewed and their responses are measured on a scale of aggression. In one instance, test subjects were given words with letters missing and asked to fill in the blanks. Those who had spent the last hour playing a violent game were more likely to see words with violent connotations, and a correlational link between violence and games was suggested. Tests like these do show the effects of media consumption on short-term memory and the associative powers of the human brain when given a suggestive prompt, but at the same time writing a word on a piece of paper is not violent behavior. Another notable experiment conducted at Brock University in Canada studied a sampling of college students who after playing their requisite violent and non-violent games were asked to give hot sauce to a food taster whom they were told did not like it, choosing between four varying intensities of possible sauces. In this case, there was no correlation between the violent game players and those most willing to give the most potent hot sauce to the taster, but those who had played games with the most intense competitive qualities were most willing to make their fellow test subjects consume the most intense hot sauce. There is no attempt to demonstrate how asking a college student to make another person consume a hot sauce qualifies as violent aggression, especially when given the vouchsafe from a test proctor. Similarly, the definitions of what is and isn’t a violent game is often questionable, with the competitive racing game Fuel categorized as non-violent, though there is nothing non-violent about a car crash. These small slips in distinction clarify the kinds of violence these experiments are searching for. It is not violence politicians fear, but one very specific form of it: gun violence. There has never been an a national scandal connecting racing games and massive freeway catastrophes. Yet, shooting games are an obsession of fearful politicians, not least because the government itself is a primary actor in gun violence, domestically and abroad. When a cop shoots a criminal it is always to keep the peace, but when a criminal shoots a cop or a fellow citizen it is a tragedy that further legitimizes not the elimination but the government’s place as its exclusive executor. Paradoxically, in order to maintain exclusive authority in the execution of violence, one cannot risk being seen as violent. “[Authority’s] hallmark is unquestioning recognition by those who are asked to obey; neither coercion or persuasion is needed,” Hannah Arrendt wrote in On Violence. “A father can lose his authority either by beating his child or by starting to argue with him, that is, either by behaving to him like a tyrant of by treating him as an equal.” In the same way, all the calls to investigate the connection between games and violence are disingenuous, a humble attempt to encourage the search for proof necessary to maintain a political power structure as it’s currently composed––to deflect every new act of violence as a failure of creative culture rather than political culture. Even the measured hesitation to claim a connection outright is a performance of patriarchal responsibility. There is no grand mystery as to what factors make a country less violent. Individual acts of violence will always be beyond our powers of prediction and control, but there is a wealth of meta-data about basic socio-political conditions that have an impact on the peacefulness of a population. According to the United Nations Office on Drugs and Crime, the United States has a murder rate of 4.8 per 100,000 people ranking it among the 100 most violent countries in the world, alarming for a country that claims to lead the developed world. The world’s least violent countries––Norway, Denmark, Japan, Canada, New Zealand––have several basic similarities that suggest our periodic attempts to dampen violence by restricting creative expression may have the opposite effect. The Institute of Economics and Peace suggest the most influential factors in making a country more or less violent are strong support for civil liberties, freedom of the press, and low levels of political corruption, all of which appear to have a bigger impact than the general measures of development like GDP, adult literacy, and unemployment. In the United States it is illegal to sell a 17 year-old a magazine filled with naked bodies, the press is largely operated by multinational corporations and increasingly driven by ad-dependent audience metrics, and Transparency International lists the United States as 19th on its Corruption Perceptions Index. With the addition of an increasingly precarious economy with flagging social support systems for the most most vulnerable, a demographic that has been steadily growing in recent years, the proposition that videogames cause violent behavior collapses into a barely perceptible ping. It is more accurate to say that videogames are where the violent frustration we experience in our daily circumstances go to find safe expression. The increasingly fraught and angry experiences offered by games aren’t immaculate conceptions of the morally corrupt, but subconscious responses created by people living in a culture of hypocrisy, parochial suspicion, and increasing disconnection between the ruled and those who rule. The most famously violent videogame in recent memory, Call of Duty, grew out of a fixation with the 5 year-long violent spectacle of World War II, which ended in two atomic bomb drops and the deliberate aerial assault on civilian Germany. Those events, still irreconcilably described as a “Great” war, have produced endless revisitation in books, film, television, theater, comic books, music, and debate, and eventually videogames took their turn. In 2007, at the height of the “surge” in Iraq, and several years into its civil war, Call of Duty shifted its synthetic lens from the 40s to “Modern Warfare,” with a new subseries of games about fighting Arab terrorists colluding with Russian nationalists to destroy the United States. It’s far more accurate to say these kinds of games as abstract emotional responses to real political violence, rather than causes of it. In Violence and the Sacred, René Girard wrote “the sacrificial process requires a certain degree of misunderstanding. The celebrants do not and must not comprehend the true role of the sacrificial act.” In agreeing to meet with Biden, in accepting that the premise of connecting mass shootings to creative expression, videogame companies demonstrate their fealty to the government, a subconscious acknowledgement that while no open threats are being made we are still subject to compliance with authority. There is something eerie in the way many in the videogame community accept their role in this ongoing charade of socio-political inquiry that willfully ignores all the basic conditions that have connections to violent behavior. In questioning whether there is something we should change about our modes of creative expression, politicians are not seeking to protect the citizenry, but their own authority. In agreeing to participate in this process, videogame creators are hastening to accept limits on expression that is one of the main contributors to increasing violence in a country. The final, disturbing message in the attribution of mass murder to creative expression is that politicians are not interested in peace but only maintaining the idea of it as a perpetual justification for their own power, which we do not expect to be non-violent, but rather judiciously violent, selectively applied to only the most appropriate victims. Since videogames allow at least a small view of what it might be like to choose a victim, to exercise that distant authority for one’s self, it is only appropriate that those who actually have this authority are most interested in erasing its depiction in forms beyond their control. Do not think we will be any safer because of it.